Cameron's electro-diagnostoset, in wooden case, c 1926. Cameron's Electro-Diagnostoset was produced by Cameron's Surgical Speciality Company of Chicago during the 1920s. 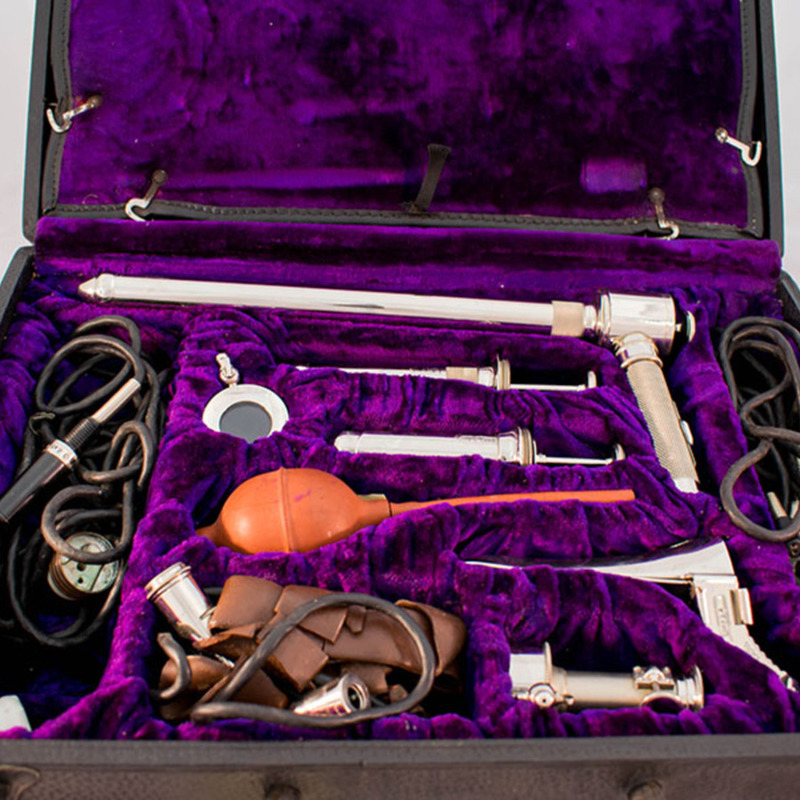 The company produced an extensive range of lamps for use in dental and medical diagnosis and the Electro-Diagnostoset seen here is, essentially, a collection of such lamps. The company produced a variety of models of these sets from the very high end, with a silk-lined leather case and a complete set of instruments, to low end sets in simple wooden cases containing a bare minimum of instruments. The set shown appears to be of the model 3A type, one of the more expensive models. The components are constructed primarily from bakelite and steel to allow them to be sterilized and increase reliability. It contains a variety of instruments including an opthalmoscope, procto-sigmoidoscope, urethroscope and a variety of bulbs in a range of shapes and sizes. In most cases the illumination was provided not by the instruments but by the handles. The set came with two handles which were connected to a power supply. A bulb could then be screwed into the top of the handle. In the case of the large bulbs (such as the long bulbs on the right of the case in the picture) that would be the instrument complete but, with the small bulbs, a variety of attachments could be fitted onto the handle to form different instruments. This particular example was imported into the UK by Dr. Archibald Young of Glasgow and is believed to be the only example in the country. Dr. Young initially inquired about ordering in 1926; the set arrived in Prince's Dock Glasgow in 1928 on board the freighter Anacortes and did not clear customs and reach him until 1929. The set cost £308 including shipping expenses. Cameron's Surgical Specialty Co.; 1922-1957; Surgical instrument manufacturer, “Cameron's Electrodiagnostoset,” Heritage, accessed April 20, 2019, https://heritage.rcpsg.ac.uk/items/show/151. Description: Cameron's electro-diagnostoset, in wooden case, c 1926. 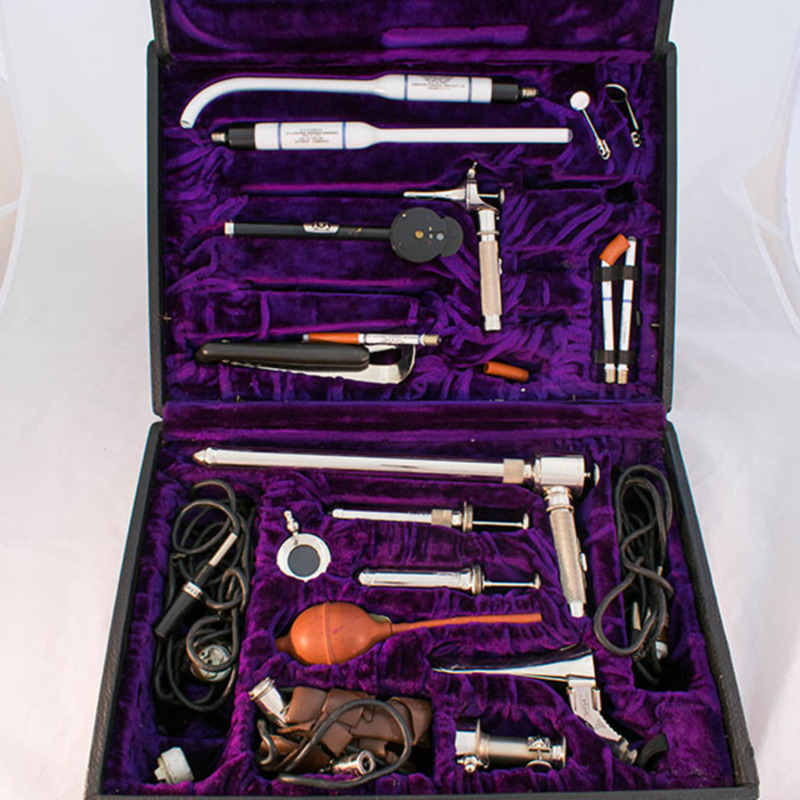 Cameron's Electro-Diagnostoset was produced by Cameron's Surgical Speciality Company of Chicago during the 1920s. 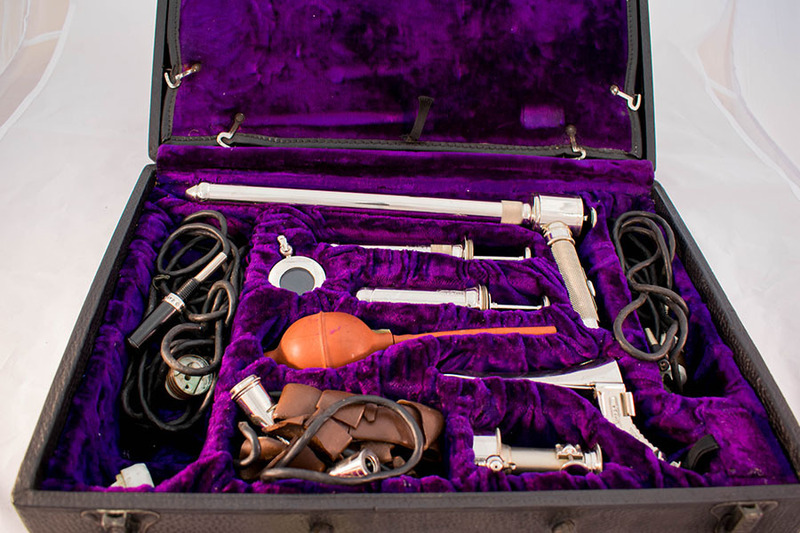 The company produced an extensive range of lamps for use in dental and medical diagnosis and the Electro-Diagnostoset seen here is, essentially, a collection of such lamps. The company produced a variety of models of these sets from the very high end, with a silk-lined leather case and a complete set of instruments, to low end sets in simple wooden cases containing a bare minimum of instruments. The set shown appears to be of the model 3A type, one of the more expensive models. The components are constructed primarily from bakelite and steel to allow them to be sterilized and increase reliability. 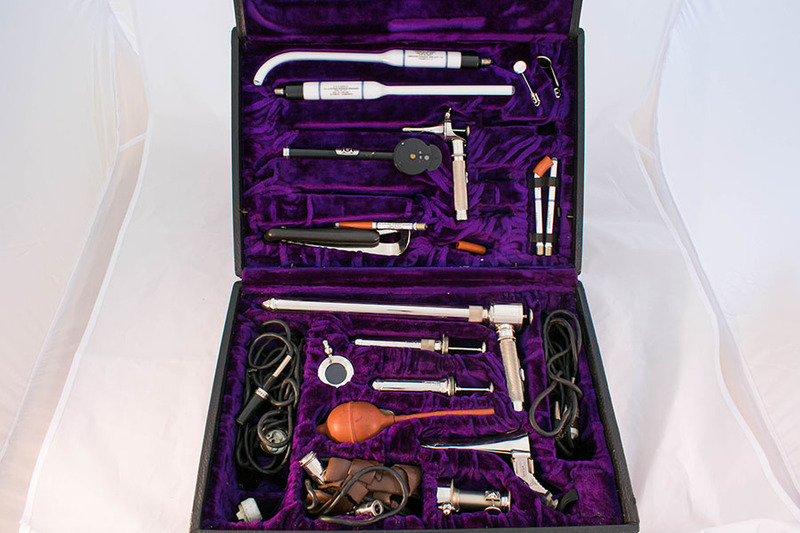 It contains a variety of instruments including an opthalmoscope, procto-sigmoidoscope, urethroscope and a variety of bulbs in a range of shapes and sizes. In most cases the illumination was provided not by the instruments but by the handles. The set came with two handles which were connected to a power supply. A bulb could then be screwed into the top of the handle. In the case of the large bulbs (such as the long bulbs on the right of the case in the picture) that would be the instrument complete but, with the small bulbs, a variety of attachments could be fitted onto the handle to form different instruments. This particular example was imported into the UK by Dr. Archibald Young of Glasgow and is believed to be the only example in the country. Dr. Young initially inquired about ordering in 1926; the set arrived in Prince's Dock Glasgow in 1928 on board the freighter Anacortes and did not clear customs and reach him until 1929. The set cost £308 including shipping expenses.